Now you have no excuse for not including watermelon in your diet. Not only are they seedless, but mini watermelons are so small, measuring 6 inches in diameter and weighing 3 to 7 pounds, you can easily take one with you to work for lunch. Plus, these little gems are super low in calories, very filling and a good source of vitamins. If hunger is making it hard for you to lose weight, you might want to consider filling your diet with more low-energy-dense foods like mini seedless watermelons. 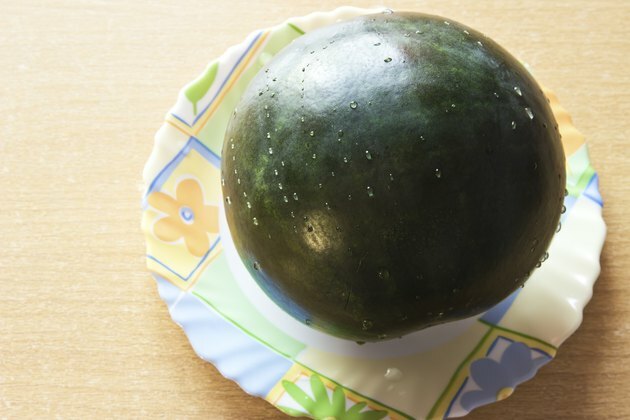 A 1-cup serving of the mini watermelon, which weighs 154 grams, contains just 46 calories. And with a mere 0.3 calories per gram, this watermelon is a very-low-energy-dense food, which means that it has very few calories compared to its serving size. Eating a diet composed of more low-energy-dense foods can help you reduce your caloric intake and control your hunger. Most of the calories in the mini seedless watermelon come from its carbohydrate content. A 1-cup serving contains 12 grams of carbs, 1 gram of fiber and 1 gram of protein. If you follow a low-glycemic diet, you may be avoiding watermelon because it has a high glycemic index, which means its carb content raises blood sugar quickly. However, you might want to reconsider, given that watermelon has a low glycemic load, which means that it has a relatively low amount of carbohydrates compared to its serving size, and very little impact on your blood sugar overall. According to the University of Sydney, the glycemic load is a better tool for you to use when trying to manage your blood sugar. Mini seedless watermelons are a good source of both vitamin A and vitamin C. A 1-cup serving meets 18 percent of the daily value for vitamin A and 21 percent of the daily value for vitamin C. Vitamin A is a fat-soluble vitamin that supports eye and immune health. The mini seedless watermelon is also rich in beta carotene and lycopene, which are the plant sources of vitamin A. As for vitamin C, it is a water-soluble vitamin that your body needs to form skin and bones and heal wounds. The mini watermelon is not a significant source of minerals, but a serving does meet 1 percent of the daily value for calcium and 2 percent of the daily value for iron. Getting enough calcium in your diet helps ensure that your teeth and bones stay healthy and strong. Iron helps make hemoglobin, and it's responsible for carrying oxygen throughout your body.